WTB - a T3 Inland or Winchester stock for an T3 .30 carbine restoration. Hi Darrell, can you let us know what area you are in? will make it easier to work out who can help. Oh and welcome along to the forum, do you have some project or restoration info to share with the rest of us? Photos would be very awesome if you have any to share. Thanks for the reply. I'm fairly new to carbine collecting although I've always owned one or two most of my life. I've become interested in the T3 in particular and the number of T3 rifles that survived the government's attempt at destroying them all after WWII. I'll gladly share what I've discovered although the search for knowledge has only just started. 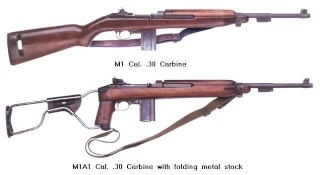 It is generally accepted that Inland only made 811 T3 carbines in 1944 and each had a 3 digit serial number preceded by one "zero" although a second series of serial numbers were issued to Inland by the Defense Department and that series consisted of a 3 digit serial number preceded by two "zero's). Supposedly rifles were never manufactored in the Inland second serial number series. The fact is that I have found at least 2 Inland T3 carbines made that are in the second serial number series. Can anyone shed light on this enigma? If this is true then the estimate of T3 Inland carbines thought to exist would greatly increase. Any help I can get to find an Inland, Winchester or reproduction stock would be greatlly appreciated! Sounds like another very interesting avenue to the Carbine collecting addiction Darrell, where abouts are you located? NZ or US? Oooops! Now I understand what the NZ stands for! Sorry Gentleman; I live in Illinois, in the U.S., and that makes aquiring a part from where you folks live a little more difficult. Anyway, communicating is still easy enough so this is what I'm looking for; it's an original T3 stock and possibly the complete night vision system. In case you aren't familiar with the rifle, it was a prototype for the M3 nightvision carbine and here's a link to what one looks like. I will gladly share the progress (and photos) of the reconstruction of this rare 1944 carbine with you folks if you are interested in hearing about it. Are you familar with this website? It has owners manuals and exploded parts drawings available to download for just about any firearm you can imagine. I use it a lot. By the way, concerning Peter Jackson........I'm a BIG fan !!!!!!!!!! I guess it would make it a bit more difficult to source your parts from here, but it has been done in the past, both ways. I'm pretty sure there have been some sold here in NZ, and I remember a conversation I had with a vet from Malaya, who saw them used there as well. As I said, another very interesting avenue to the Carbine collecting fun, and I'm sure some of our kiwi contributors on this site will be able to share their info on them as well. I look forward to some pics at some stage. Thanks, Alex. That was a great photo and some interesting facts. I appreciate the information. Here is a truly great carbine club 9they have members from all over the world) and dues are reasonable....http://www.carbineclub.com/. They have a tremendous amount of information available.